In previous articles I described the restoration of the interior of my ‘65 Riviera to include the veneer, door panels, console and dash. This article will discuss the installation of a modern audio system with new speakers as well as a subwoofer and power amplifier, if so desired. I covered the installation of two 10-inch speakers in the rear arm rests in the Jan/Feb Riview when the rear arm rests were reupholstered. In this issue I will discuss the installation of speakers in the front, under the dash pad and in the rear behind the chrome grille. In the next issue I will describe how I hid the new system in the glove box, while keeping the factory radio for an original appearance. In a following issue when I address restoration of the trunk I will include the installation of the optional subwoofer and power amplifier. It is important that you initially run cables for the speakers and mark them accordingly. The easiest way is to place the cables under the floor carpet on the passenger side to the rear. If you later want to install a subwoofer with power amplifier, also continue these cables to the trunk. Soldering or clipping plugs to the cables later makes connecting the speakers much easier. 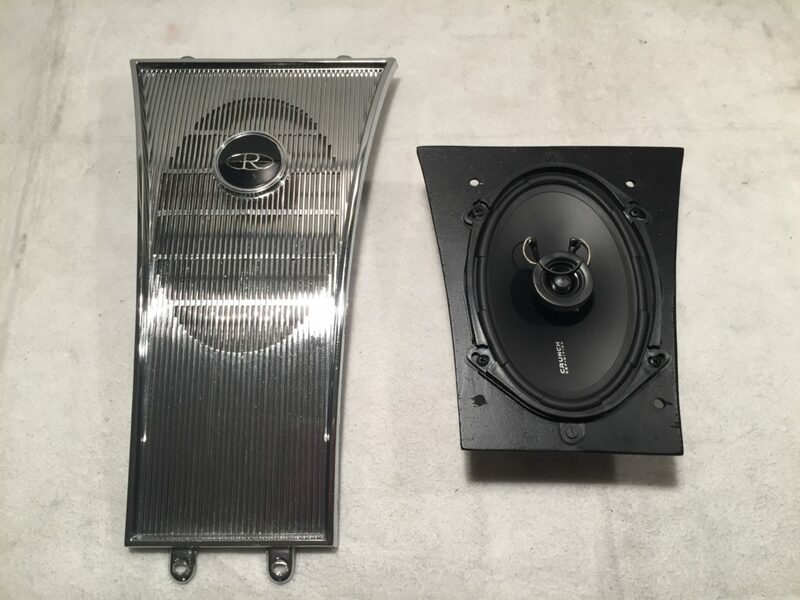 I purchased a pair of “CRUNCH Definition Coax DSX-572 5×7 inch” speakers for both front and rear. I started with the rear speaker, which is behind the chrome cover, located between the rear seats. 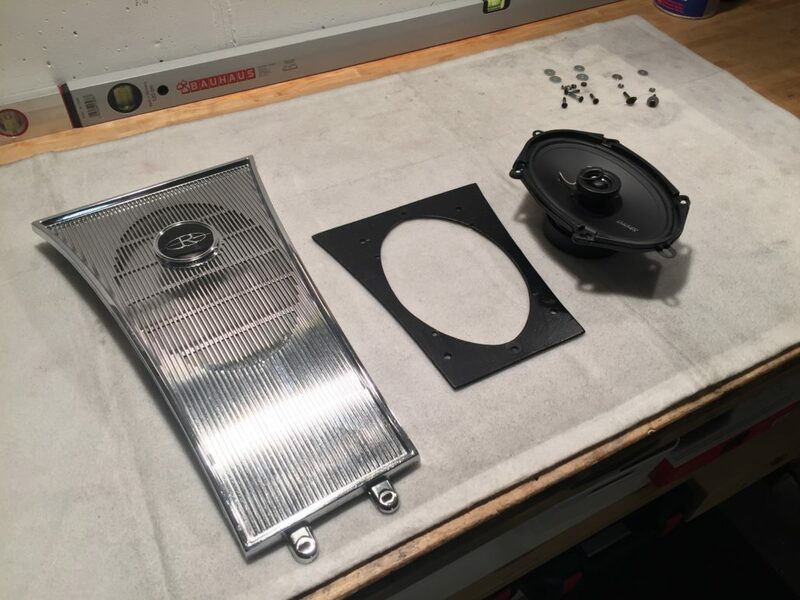 I immediately discovered that the mounting holes on the new speakers did not match the original holes in the chrome cover. I realized that I needed to create a mounting plate. I cut a 4-5mm thick birch board to fit the shape of the cover, to accommodate the 5×7 inch speaker. I marked the locations of the four holes in the cover onto the mounting plate and drilled the holes. Then, I cut an oval hole on the plate for the speaker using a jigsaw (Fig. 1). 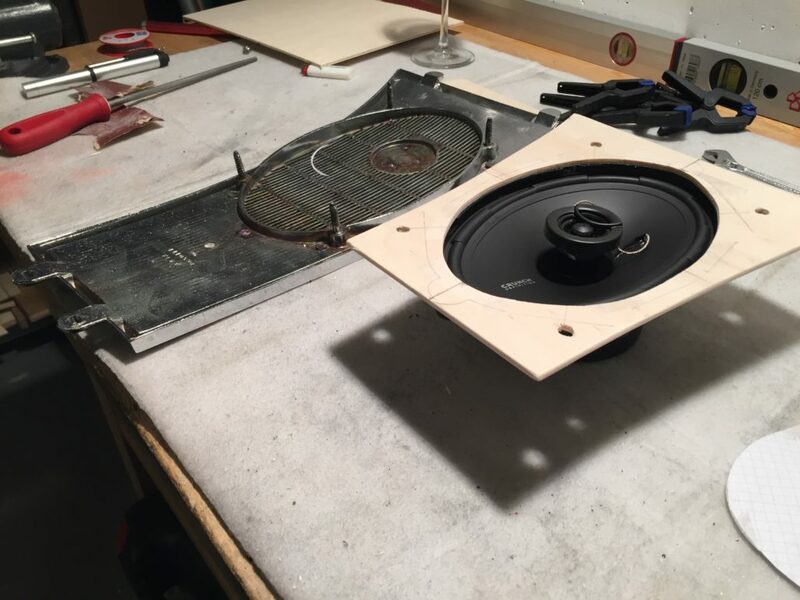 I marked the mounting holes of the speaker on to the wooden plate and drilled new holes. I painted the wooden plate black (Fig. 2). 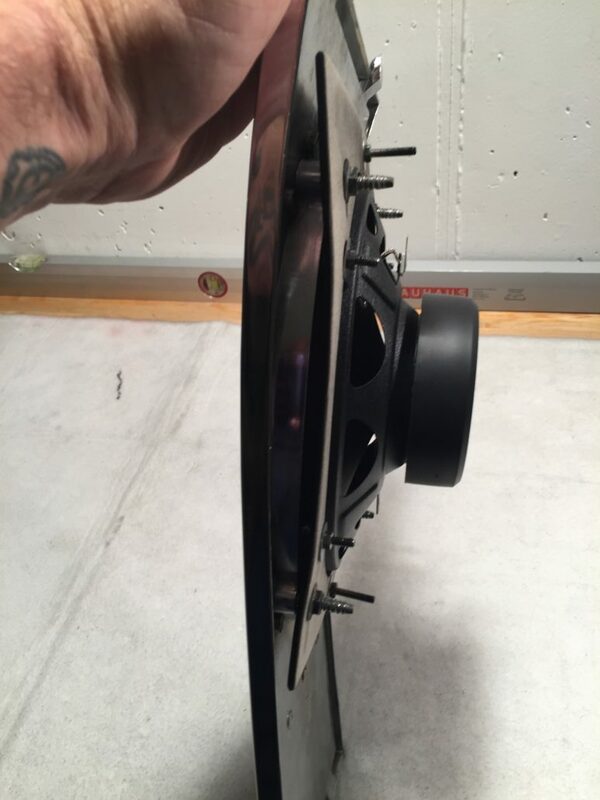 The speaker was fastened to the wooden plate with screws and nuts (Fig. 3) and the mounting plate to the chrome cover (Fig. 4 & 5). Before replacing the chrome cover between the seats, make sure that the routed cables are plugged into the speaker in the correct polarity. IN THE NEXT ISSUE, I’ll discuss installation of audio system in the glove box.